When straw bale building, one inevitably ends up with lots of wood that needs both gluing and nailing together. But what glue should a natural builder use? Where there is a need for exterior grade glue and certainty that the fix will not be compromised over time, the current glue you frequently see being used is Cascamite. This is a synthetic, urea-formaldehyde glue that generally comes in powder form for mixing on site. You may also hear of phenol formaldehyde glues like Resorcinol. And formaldehyde is bad, right? Well, yes. And no. Formaldehyde is naturally occurring (and companies also make it). It can be found in small amounts in fruits, vegetables and all sorts of stuff, including us. And, like many things in life, that’s the thing – small quantities can be okay, but larger quantities can start causing problems. This informative American Cancer Society article suggests the presence of formaldehyde in the air at anything greater than 0.1 parts per million can result in some folk experiencing irritation. This could be an itchy nose, watery eyes, a burning sensation in the eyes, nose, throat etc. Because these reactions are very similar to those for all sorts of other illnesses it can be hard to pinpoint formaldehyde as the cause, but it’s certainly one of those things some people are more susceptible to. Formaldehyde off-gases, i.e. once it is manufactured and put into a material there is a period of time when it will put out more formaldehyde into the atmosphere than it will afterwards. When added formaldehyde is used in building products it ups the concentration and problems are more likely to occur. Simple choices when specifying materials can mitigate the formaldehyde risk, and minimise the extra chemicals you’re buying and furthering the use of, perhaps unwittingly. For example, we use a lot of oriented strand board in straw bale structural beams. We always use Smartply OSB3 because it contains no added formaldehyde, whereas I believe Sterling board and other makes do use extra formaldehyde in the manufacturing process (I am happy to be told otherwise!). This article from the US points out how important the need for research into finding an effective and more sustainable alternative to formaldehyde based glues in board manufacturing is becoming. So. What about the glue. What’s the point of using Smartply if you’re going to stick it together with a formaldehyde glue? Aren’t you undoing all your good work? Well, certainly partially, yes. I’m no scientist and I’ve love to hear arguments for and against but, perhaps not surprisingly, I’d much rather use something else. I understand wool insulation sequesters free formaldehyde, and because we often use that inside the glued beams then that possibly mitigates off-gassing to some degree, but I’ve seen no real scientific evidence. What we need is a fantastic natural wood glue. Apparently there are no natural wood glues that are not degraded by water in some way, so full-on external use might be difficult, but what about some research on the limits of what does exist? 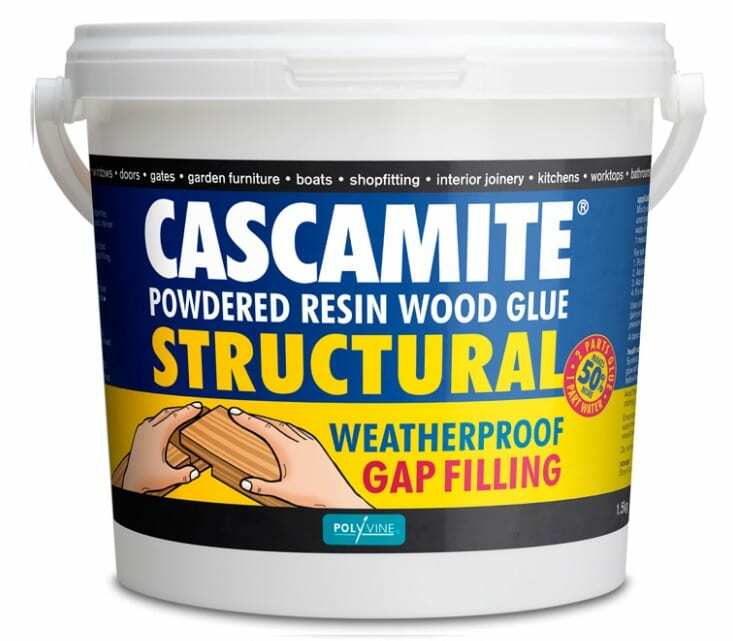 There are actually several really good natural glues, and for building purposes I think the absolute best is casein glue. Casein glue is made from milk and humans have used it for thousands of years. It’s amazingly good glue! I’m desperate to do some casein glue experiments and if anyone else is interested, or knows of any good casein glue resources, I would love to hear from you! For further comparison, this page mentions casein glue, along with the formaldehyde ones. And this kind of brings us full circle. Cascamite was born out of the rapidly expanding chemical industry of the mid 20th century. I found this amazing article from the February 1941 issue of Popular Science magazine (from the US – the advertisements are as much fun as the articles!). I’d never really made the naming connection between CASein and CAScamite. 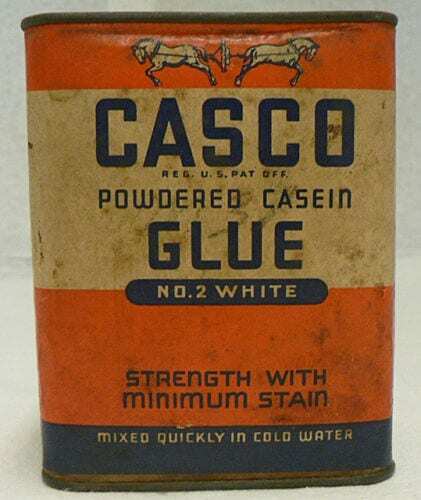 It turns out the ‘Casein Company’, as a producer of casein glue in the US – branded Casco – was looking to chemicals to make better glues (chiefly more waterproof ones). And consequently Cascamite lives – and Casco died. 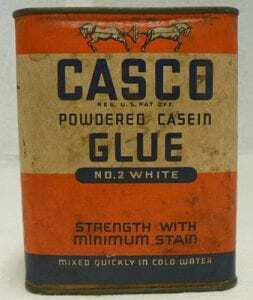 I wonder if we can see a revival of casein glue? I for one am prepared to stick with it. Check out this recipe and project for casein glue and let me know how you get on!